Communications between the Allies and the townspeople were dangerous and difficult due to the German occupation of the town. There were relatively few witnesses to the crash and those who had witnessed it were unable to get messages to the Allies. The six airmen who were aboard the aircraft were quickly buried by the Germans in a common grave in the civil cemetery at Sées. In England, the airbase from which the plane departed, listed the six airmen as ‘missing in action’, and later notices were mailed to family members advising them that all aboard the aircraft were “presumed dead”. 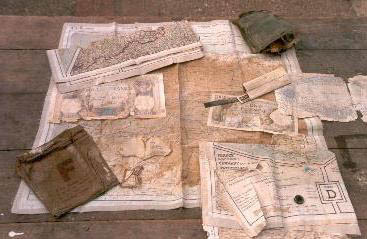 At the time the notices were sent to the families, the war still raged and communications continued to be difficult. The years passed and those who may have witnessed the crash have passed away or moved away from the area or may no longer be able to remember those horrible days of the war. Despite the passage of time, for me, the image of the crash was something I could not drive from my memory. After various activities and travels around the world, in July 1998, I returned to the area and decided to enquire about the aircraft and the crash and to try to learn more about the mystery that had haunted me for almost 54 years. Surprisingly, I learned that no one in the town remembered the crash, nor had the residents of the town been told about it. It was a particularly disturbing time for the residents, having been under German occupation for four years. Everyone had heard about a planned invasion by the Allied Forces and looked forward to that day. As it happened, the crash of this aircraft occurred only two weeks prior to the invasion of Normandy on June 6, 1944. The residents of the town then had hope for freedom and the memories of the mysterious crash were pushed to the back of their minds. In fact, almost another 12 months would pass before VE Day and many more months after that before lives returned to normal. After visiting the town and asking questions, I decided that I would continue my investigation, but how? I could not remember the precise date of the drama but I found a burial register for the civil cemetery where it was recorded that six unknown airmen had been buried there in a common grave on May 22, 1944. Further information was obtained from the Commonwealth War Graves Commission where a report told of the six bodies beening exhumed from the cemetery at Sées and re-interred at the Canadian War Cemetery at Bretteville-sur-Laize in late 1945. The date of May 22, 1944 which I discovered on the burial register would enable me to contact the British Air Ministry and the Royal Air Force. The Ministry of Defense quickly responded to my letter in August 1998 and I learned there was a crew reported missing on the night of 22/23 May 1944. The Ministry of Defense reported that a Whitley bomber (24 OTU) departed Long Marston on the night of May 22. 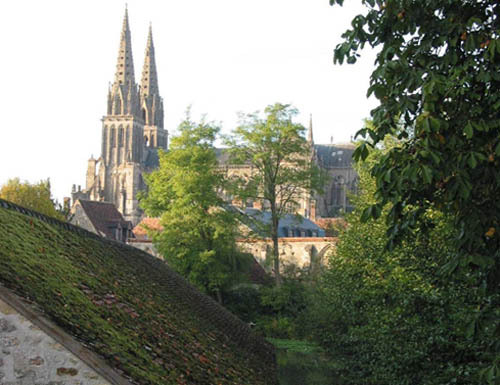 The mission was to drop leaflets (Nickel Sortie) over Alençon, and to also take strategic photographs of the area around Alençon, Le Mans and Laval, and to return to base in the early hours of May 23. There was confusion, however, when I discovered the written report submitted by the local French gendarme, in which the date of May 23, 1944 was reported as the date of the crash. From this report I learned there had been several items belonging to the crew found at the crash site – maps of occupied Europe that were printed on silk, identity photographs, a dictionary, and French francs. This information immediately made me think of an Allied aircraft. The Air Ministry provided the names of the six airmen and without hesitation I asked the local newspaper, ‘L’Orne Hebdo,’ to publish the names which appeared in the November 25, 2003 edition of the newspaper. It was also learned that the aircraft had been shot down by the DCA battery that was located at the bridge at Madeleine meadows. Buvron, came forward with a ring that was also found at the crash site. 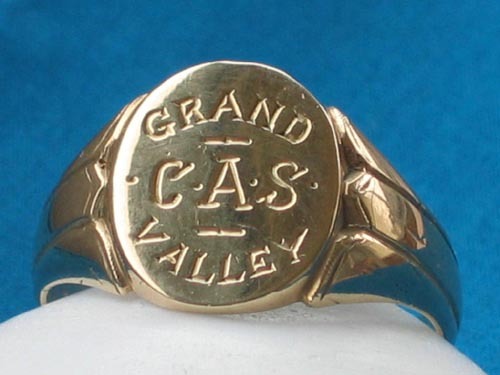 The gold signet ring is engraved with “Grand Valley, C.A.S.”, on the top and the initials, “WGH” on the inside of the ring. The ring has been kept by the Buvron family and it has been polished and caringly preserved for 60 years. 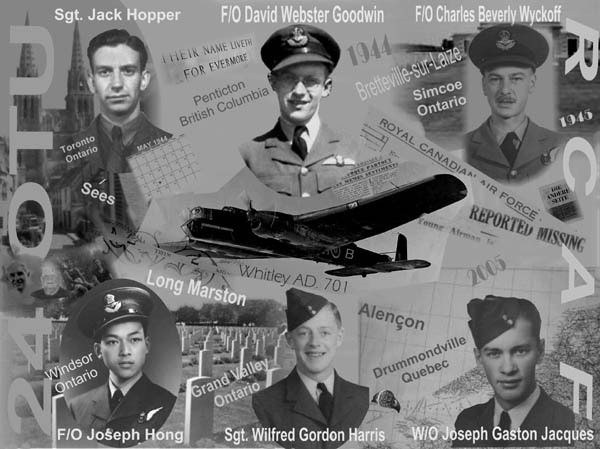 Mr. Buvron checked the initials in the ring and they matched the initials of Sergeant Wilfred Gordon Harris, an air gunner with the Royal Canadian Air Force. Coincidental postings, on the same day, to a website in England, by me and by Mrs. Shirley Stone, from Ontario, Canada, resulted in Mrs. Stone offering to assist me in trying to locate the family of Sergeant Harris. In less than a week contact had been made with the brother of Sgt. Harris. 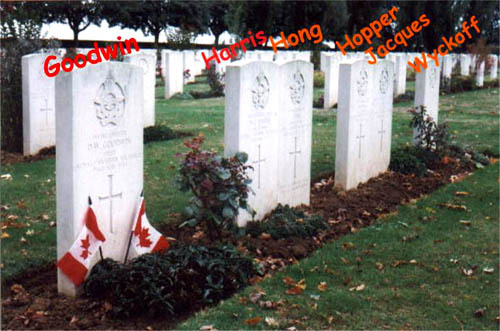 Jim Harris was 12 years of age when his brother was killed and it came as a great shock to Mr. Harris to learn his brother rested in a proper grave. Mr. Harris said the town of Grand Valley presented signet rings to all servicemen who were posted overseas. This ring certainly confirmed the identity of the crew who lost their lives in the crash of May 22, 1944. Upon learning there were five other crewmen who perished in the crash, Mrs. Stone offered to search for the other families. With determination, Mrs. Stone began writing letters, sending e.mails, and making telephone calls to arrange for articles in various publications in Canada. Contact was made with the Royal Canadian Air Force, The Royal Canadian Legion, the Air Force Association, the RCAF museums in Trenton, Ontario and in Brandon, Manitoba, and the National Archives of Canada. Articles were published in the Globe and Mail, the Vittoria Booster, and the Quebec Tribune as well as reports on the local television channel in Drummonville, Quebec, and a report by Tom Kennedy of CTV, a Canadian national television station. Warrant Officer Air Bomber Joseph Gaston Jacques, and the wife of David Webster Goodwin. write letters to the families which provided information about the crash and the location of the graves. Unbelievably, we learned that only two of the six families had been notified of the location of the graves at Bretteville-sur-Laize. The other families had always thought the aircraft had crashed in the sea or the English Channel. So many years of research, anguish and unanswered questions for these families and it is with sadness and with joy that we share their emotions upon learning about the fate of their loved ones. Unanamously the families tell us – “Our lives have changed since learning the truth about this crash. We finally have learned about our loved ones - their lives overseas, their courage, their duties to their nation, and the attachments to their families. We cannot express in words our feelings after learning about the location of the graves”.